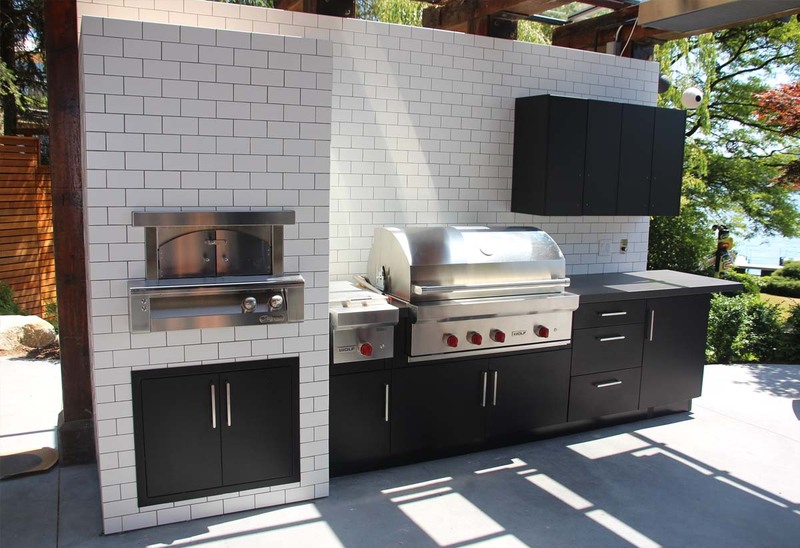 If you’re the type of person who loves a good barbecue party with friends and family or just someone with a passion for grilling, an outdoor kitchen just might be the perfect addition to your new or remodeled home. When designing an outdoor kitchen personalization is a must. 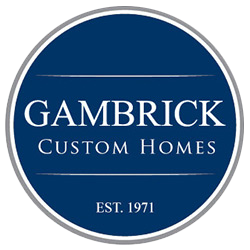 Just like when designing for your homes inside spaces, always keep in mind your personal preferences, needs, lifestyle and taste. A great outdoor kitchen should be an extension on the home and have a good flow from inside to out. 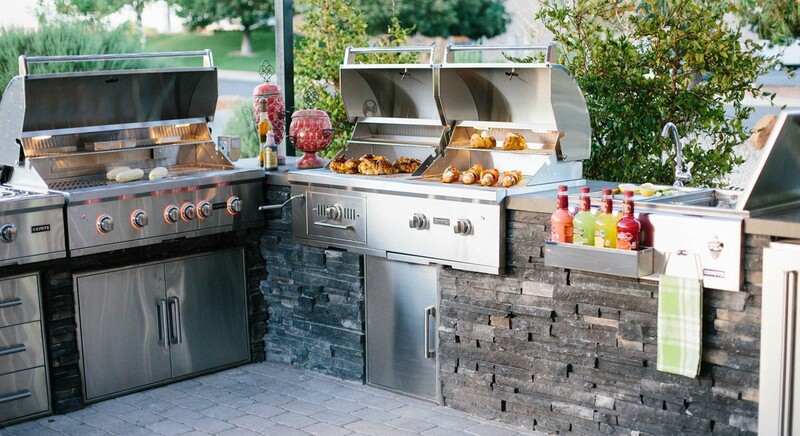 In this article we’ll discuss our top 10 best outdoor kitchen ideas and designs for 2019. 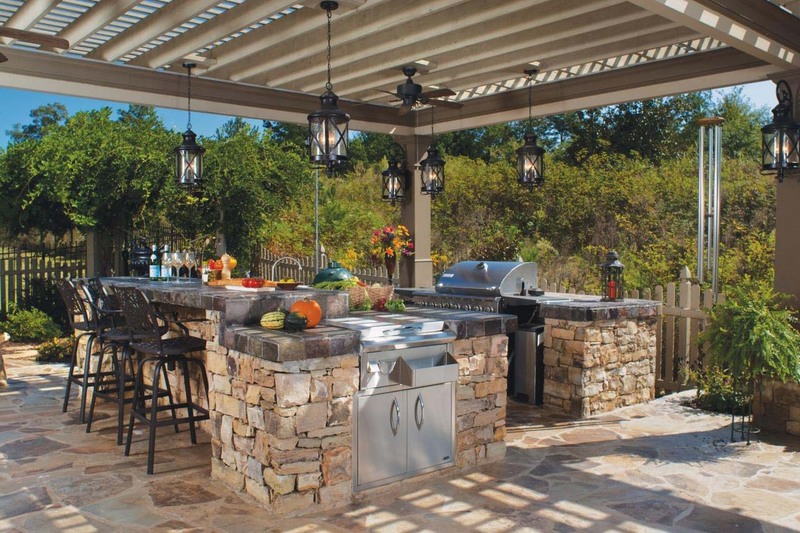 Check out the complete outdoor kitchen designs with bar, seating area, storage, and grill. For smaller spaces try just a sink and prep counter for mixing drinks and prepping grill meats and vegetables. 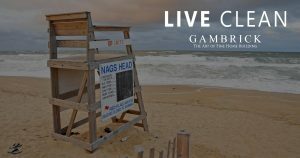 If you’re worried about the elements, don’t be. 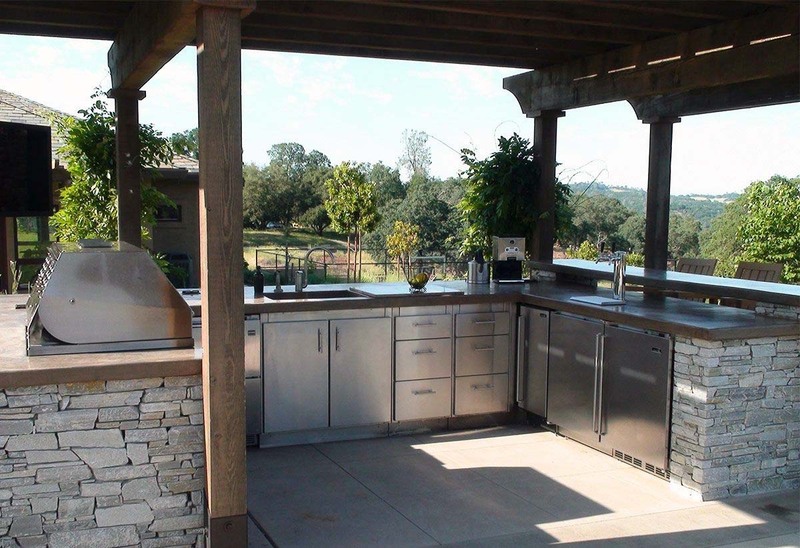 We’ve got outdoor kitchen designs with retractable or permanent roofs so you can enjoy your outdoor kitchen in just about any weather. Some outdoor kitchens have fun features that’ll make your yard unique like a pizza oven or fire pits. 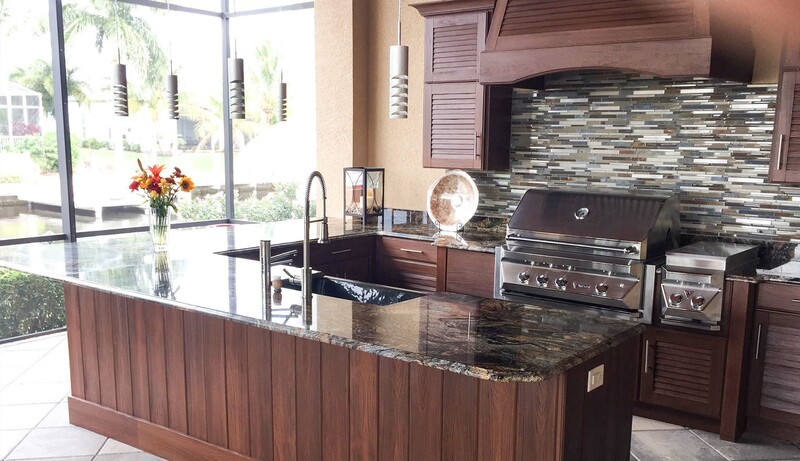 When it comes to outdoor kitchen ideas there’s so many possibilities it’ll be easy to find one that’s a perfect fit for you and your home. This setup is a full scale outdoor kitchen with multiple dining areas. An extra deep counter top provides plenty of space for both preparation and appliances. Guests can sit with the cook as food is prepared on the large bar top. Keep cool and dry beneath the custom built wood pergola with metal roofing. Granite top with reel stone counter, stainless steel drawers and appliances. Stainless steel sink, mini fridges, wine chiller and dishwasher. Stainless gas grill with separate burners. Modern finished concrete tile patio floor. A setup like this is truly a full kitchen that’s outdoors. 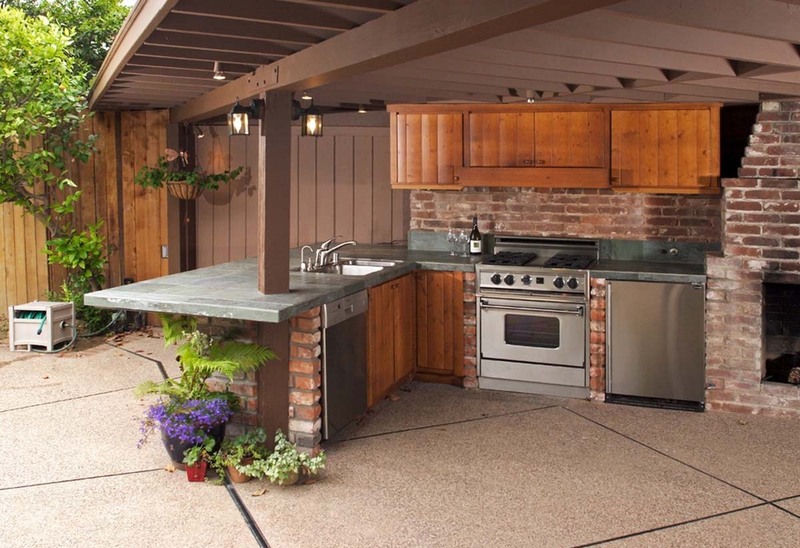 Throwing a party is easier and fun if you have an outdoor kitchen like this one. Equipped with tons of seating and a huge countertop for prep, appliances and bar seating. Rustic wood cabinets and counter with brick veneer. Stainless appliances include a full sink, dishwasher, mini fridge and stove with over. Tucked beneath a roof extension of the house so you can cook in just about any weather. Brick wood burning fireplace . Finished concrete patio floor. Custom tile countertop. Recessed lighting. This transition room opens to a beautiful outdoor entertainment space with pool, jacuzzi and seating areas. Stainless Outdoor Kitchen with Key West doors powder coated in ‘Sudan Brown’. 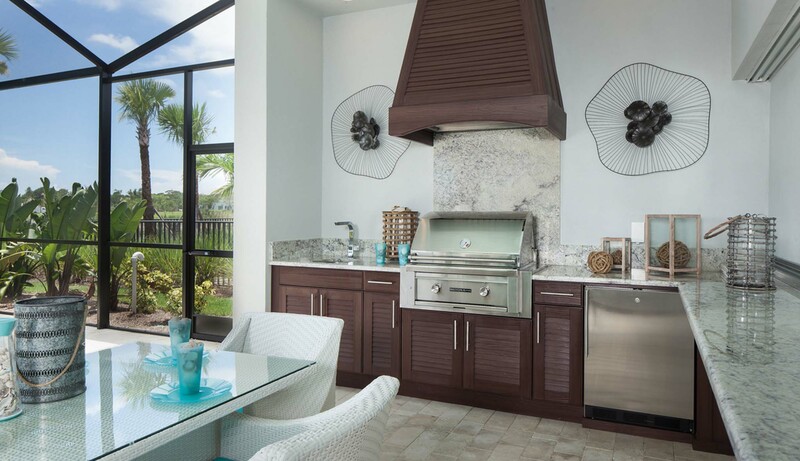 The kitchen features a sink, grill, and side burner to accommodate a variety of cooking styles. Small under mount prep sink with black faucet. Black granite counter top offer more than enough space for prep and grilling. Plenty of cabinet space. This kitchen is positioned nicely within a covered patio area keeping it dry and usable in almost any weather condition. Recessed lighting with ceiling fans. A modern design twist to a classic layout. Finished concrete slab patio floor. Black cabinets provide plenty of storage space and look great with polished steel handles. Stainless steel Wolf grill with side burner. If you enjoy making homemade pizzas, this kitchen designs for you. White tile walls with dark gray grout compliment the black cabinets and concrete finish perfectly. Dark wood frame to an overhead pergola. Plenty of seating and a beautiful river view. This basic layout works well with any style outdoor kitchen, it doesn’t have to be Modern if that’s not quite your thing. Strange to call this an outdoor kitchen design since it’s fully enclosed, it’s more like a 2nd kitchen dedicated to grilling. Great for entertaining outdoors at any time and in any weather. 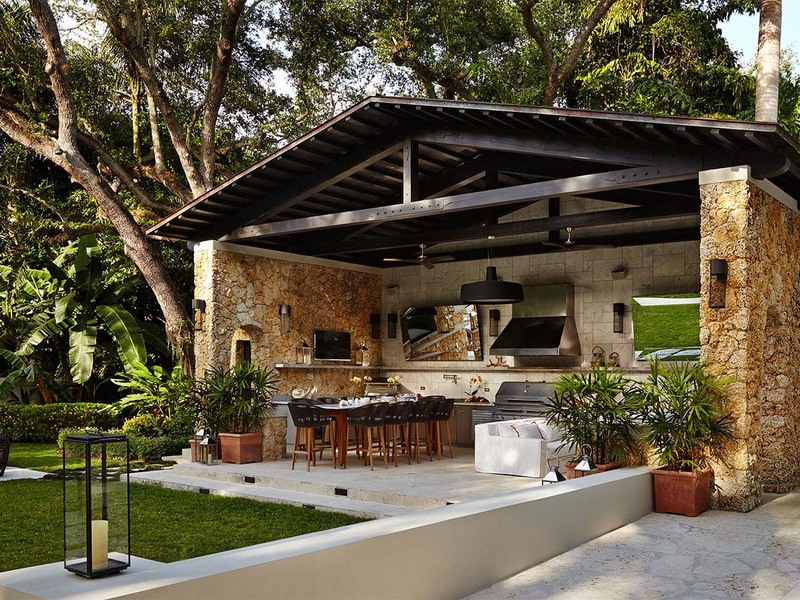 The perfect outdoor kitchen design for climates that reach extreme hot or cold. Completely enclosed in glass like a 4 season or sun room. Controlled with it’s own dedicated mini split so you don’t have to waste money on heating and cooling when it’s not in use. Large stainless steel grill with separate burner. Dark wood cabinets with granite countertop. Large stainless under mount sink with chrome faucet. Beautiful glass tile backsplash. Travertine tile floors. What sets this design apart from all the others is the additional design options available to you now that your outdoor kitchen is weather tight. These stainless steel pendant lights for example wouldn’t be an option with most other designs since they’re for interior use only. Another fully enclosed outdoor kitchen idea. These designs are more like actual kitchen except the main cooking are is an outdoor grill instead of a traditional stone. Equipped with everything you need for your next bbq. Large gas grill, bar sink, mini fridge, dishwasher and plenty of cabinet space. Granite countertops. Granite backsplash. Dark wood louvered cabinets. White wicker furniture with glass top provides seating for 6. Recessed lighting and climate controlled. Enjoy your outdoor kitchen year round, day or night. This setup is a full service outdoor kitchen design with large dining areas. An extra deep counter top provides plenty of space for both preparation and appliances as well as places to eat and drink. Guests can sit with the cook as food is prepared on the large bar top. Keep cool and dry beneath the custom built wood pergola with metal roofing. Granite top with reel stone counter, stainless steel drawers and appliances. Stainless steel sink, mini fridges, wine chiller and dishwasher. Stainless gas grill with separate burners provides multiple cooking options. Reel stone patio with cement grout. The perfect outdoor kitchen design for any size country estate. 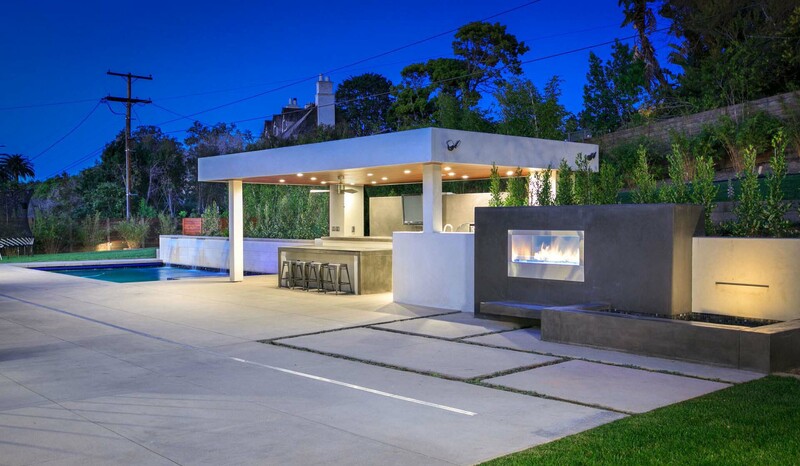 Impress your guests with this ultra modern outdoor kitchen design. Finished concrete and square edges are the main themes of this outdoor kitchen design. A wall insert gas fireplace is a beautiful touch, especially when entertaining at night. Modern rectangular pool with waterfall features. Stainless appliances. Rectangle freestanding roof with concrete finish and wood soffet. Recessed lighting and stainless ceiling fan. Stainless steel stools. Plenty of storage in the stainless pull out drawers set into the concrete counters. 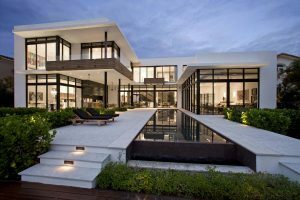 Because of their rarity, modern designs really tend to stand out and draw a lot of attention, especially in NJ where modern designs make up only about 1% of new homes built. 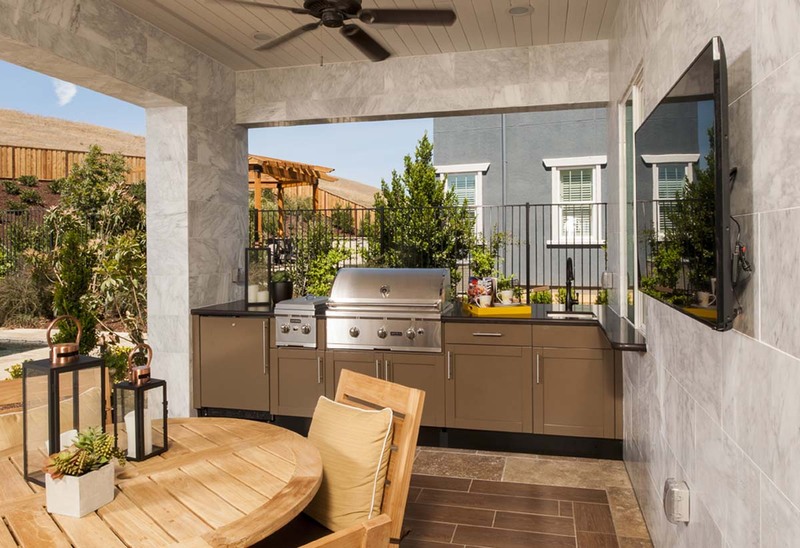 No one will want to miss your pool parties if you have an outdoor kitchen like this one. Equipped with a stainless steel grill, bar sink, mini fridge and plenty of counter space. Large black granite counter top with bench seating along the edge of this in ground swimming pool. Serve guests your delicious bbq as they lounge in or out of the pool. Travertine tiles with marble pool bullnose. Large marble pillars support the custom built pergola roof. Plenty of space for entertaining with seating for 8. This design is perfect for clients with large back yards. A pool with nearby pool house and outdoor kitchen is the ultimate in outdoor entertaining. Large enough to accommodate a table with 10 chairs, a sofa for 3, full bar, grilling area with side burner, 4 flat screen tvs, fans and overhead lighting. Travertine floors with real stone walls. Travertine wal tiles. Exposed beams with metal roof. Modern cement walls painted white. Black accent lighting. 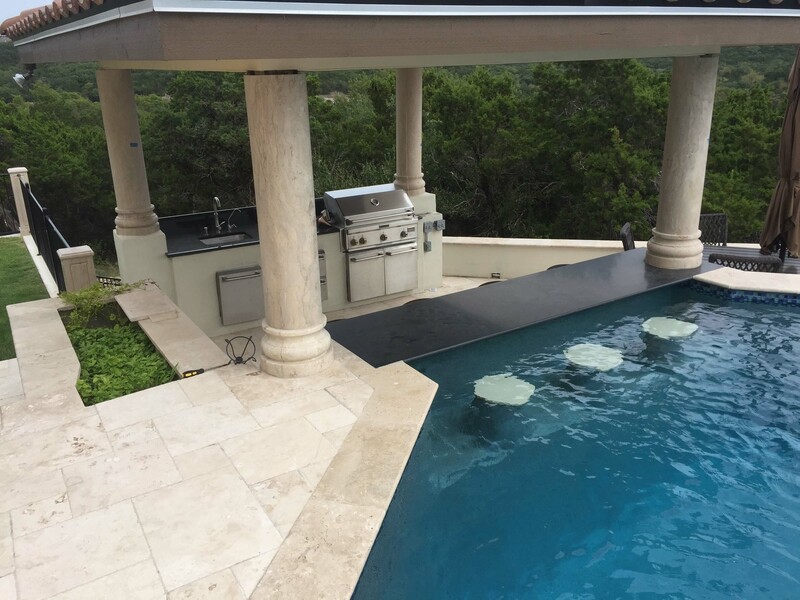 If your looking for outdoor kitchen ideas and have the space consider one combined with a pool house to remedy all your outdoor entertaining needs.